ChessMaine: Tired of Driving? Try Surfing! Tired of Driving? Try Surfing! 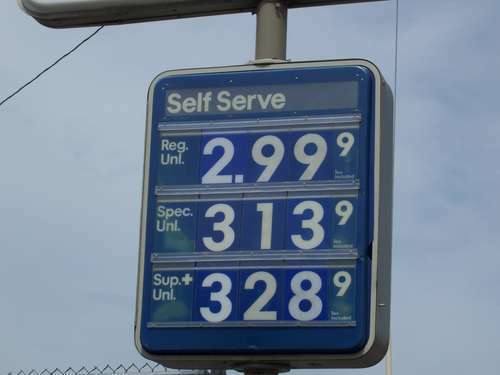 06.15.06 Skyrocketing fuel prices might have you thinking twice before you register for your next tournament. Maine is a large, rural state and it can be difficult and cost prohibitive to get to the next tournament. Enter the internet, which has been refered to as the perfect medium for chess. We started to muse: Would it be possible to play USCF-rated tournaments and matches over the internet? The short answer is yes...and no. Please note: The intention of this article is not to dissuade players from over-the-board play--quite the contrary. Its aim is to present some online options for USCF-rated and skittles chess, and to walk the reader through the steps necessary to start playing chess online. Online chess play is becoming more and more popular with new sites poping up all over the net. Some sites are free while others require a membership fee. To play games and chat with opponents most sites offer a free download of software that enables you to get a graphical board interface and some type of console window. For the occasional player who is not interested in downloading software, there are so-called Java sites that require only a Java-enabled browser. Although not requiring any special software, there does tend to be a bit of a wait for the Java applet to load from these particular sites. This article will walk you through the process that will get you up and running (or up and playing) on two popular internet chess sites. Before we start with that though, let's first examine our original question: Is it possible to play USCF-rated games on the internet? There is currently one and only one place to play USCF-rated games on the internet. If you guessed the USCF's online chess server move to the head of the class! The site www.chess-live.com does allow USCF members to play rated games online. There are a few caveats however. The first is: only Quick chess games are rated. Quick chess is defined as games with time controls greater than and including G/10 but less than G/30. It is true that over-the-board games played at time controls of G/30 to G/60 inclusive are dual rated. This means that two separate ratings are calculated for games played in this time control window--one is a Quick rating the other is a Regular rating. But as stated above, only games from G/10 to less than G/30 are considered permissible for online USCF-rated play and will receive a Quick chess ratings calculation. The second issue is a player is only able to play the rated Quick chess games as part of weekly scheduled tournaments. No playing games when you want to and no matching individual players. Right now if you want to play USCF-rated games online ChessLive is "the only game in town" (pun indended). Still, it does leave one wanting for more, namely: Regular rated games at various time controls, the ability to play at the time of one's choosing and it would also be nice to be able to match a particular player. While sitting at my computer in the plush offices of the ChessMaine.net World Headquarters, I decided to pen a letter to the USCF to see if we couldn't do something about this. Per our conversation of this afternoon, I am writing to express my interest in petitioning the Rules Committee to allow USCF-rated Regular Chess games to be played on www.Chess-Live.org. I understand Quick Chess games are currently being played and rated online. Rated chess on the internet represents a significant opportunity for the USCF and its members. In rural states such as Maine it is often difficult and cost prohibitive for players’Äîboth scholastic and adult’Äîto travel great distances in order to play USCF-rated games. I am confident that giving players the opportunity to play USCF-rated Regular Chess online would result in an increase both in membership and activity. Some may be skeptical about allowing Regular Chess games played on the internet to be USCF-rated because of issues related to the possibility of cheating and misrepresentation. These are valid concerns and would be addressed by requiring a USCF-certified tournament director to be present at both internet site locations. Having a TD on site would ensure a high level of confidence in the validity of the games being played and see that all USCF rules of chess, code of ethics and procedures and policies are observed. I would welcome the opportunity to meet with you to discuss this issue in more detail. If you have any questions or need further information please do not hesitate to contact me at the above address and phone or via e-mail. Thank you for the lively discussion on this topic and your willingness to present this idea to the appropriate USCF professional staff. I look forward to hearing from you soon. Thank you for presenting your ideas concerning online play. I showed your letter to Executive Director Bill Hall, and he indicated there has been discussion about the issue. The rules committee is going to discuss the possibility of Regular rated online play in the near future. Once again, thank you for the time and effort you have undertook in order to express your ideas. We appreciate your efforts. up to speed on any developments. Thanks for your inquiry. I suppose you could say the proverbial ball is rolling on this issue, we'll just have to wait and see if it ends up in the net (no pun intended). In the meantime, the web is wide open for chess, chess and more chess. Let's now take a look at how one can get online for some Quick rated, slow time control, blitz, bullet, varient or whatever type of chess you prefer. 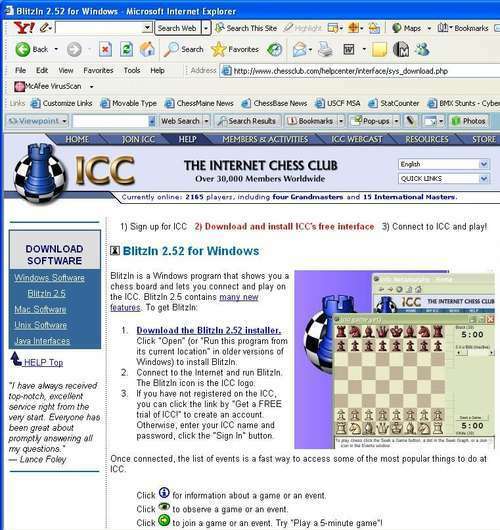 The preeminent online chess playing site has to be the Internet Chess Club or ICC. The ICC provides a vibrant online community where chess enthusiasts can gather to play, take online lessons, follow tournaments happening around the world and stay current on chess news. The ICC does have a $40.00 per year membership fee but folks can also sign in as a guest to play an unlimited number of games for free. The ICC homepage boasts, Today ICC has more members, more Grandmasters, more volunteers, and more loyalty from our members than any other classical game service on the internet. We care about making ICC the very best place for people to play and learn together. This is where news and information is posted. This page is your "control central". To ask a question type: tell 1 Your question here in the bar at the bottom of the window. When you click on a dot in the Matches Sought window, the New Game Board window will automatically appear and your game will be underway. Good Luck! On this page be sure to check USCF Basic to get the free membership for USCF members. Hopefully you will eventually get to this page--the Registration Sucessful page. and sign the service agreement. OK that wasn't too bad was it? You should now have a ChessLive icon on your desktop. Click that puppy and here we go! Similar to the ICC Blitzln page, the ChessLive page has a choice of window options. The defaults are Home, Info, News and Board windows but you can choose the window options you prefer. Here these four are displayed at the same time. This let's you skip around and maximize windows you are presently working in. In the Info window you can find upcoming tournaments including nightly (except Fridays) USCF-rated Quick events. When you click on the icon of the tournament (or game) you would like to play in you are prompted in the Main Console which is one of the tabs in the Home window. You need to read and agree to the Entrance Agreement (below). TournamentBot(TD) tells you: You must read and agree to the following agreement before you can join a tourney. Read the following then type "tell TournamentBot Agree". I will play each game myself and will not allow another person to use my account to play or offer assistance or advice of any sort during a game. 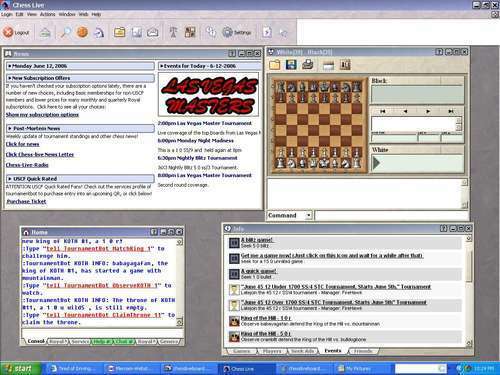 I will not use any computer programs to help me during the game, including chess software, dedicated chess computers, or other automated online or offline aids. I will not refer to chess databases, histories, or lessons during the game, including either computer chess databases or books. I will endeavor to play to the best of my abilities and will not deliberately lose for any reason. Checking for task-switching during a game to another chess program or database. Comparing my game against various chess engines, looking for high correlations between my moves and computer-suggested moves. Having expert chess players examine the moves and timing of the moves to look for unusual or inappropriate behavior. Looking for substantial deviations from my performance in this game compared to my ratings and/or previous games. I understand and agree that if GamesParlor, in its sole judgment, determines that it is highly likely that I have violated any of the above rules, I will forfeit my games and my standings in this tournament and my entry fee, if any, will not be refunded. Repeat offenses may also lead to more permanent restrictions. Type "tb agree" to agree and proceed to your tourney. TournamentBot is an automated TD who organizes tournaments. If you are playing a USCF Quick rated tournament you also need to pay a small fee although occasionally you can find tournaments with waived entry fee. After you tell the TD you are in, agree to the rules and pay up you are ready to play! At the beginning of each round a board window will appear with your opponent on the other side. You can chat with your opponent by typing in the bar at the bottom of your board window. It does take a while to get used to the rather complicated navigation system on ChessLive but after you spend some time there you'll pick it up. Best of luck in all of your games, play with good skill!